I'm not 100% on if Masters should be counted but the Digimon Wikia is adament that they count as "their profiles mention they digivolve into their lines on the game". Well, they do evolve that way... in that game. I don't think the wikia should take those profiles as having any greater significance. I asked the admins on there as to why Masters counted for 'canon forms' and the reply I got was - "They are counted because the game itself contains profiles for the Digimon, in which the evolutions are depicted/stated. Those are the sources used, not the gameplay evolution lines.". Profiles are profiles I suppose. Like how the DRB is a profile. Betamon > Airdramon > Megadramon > ??? 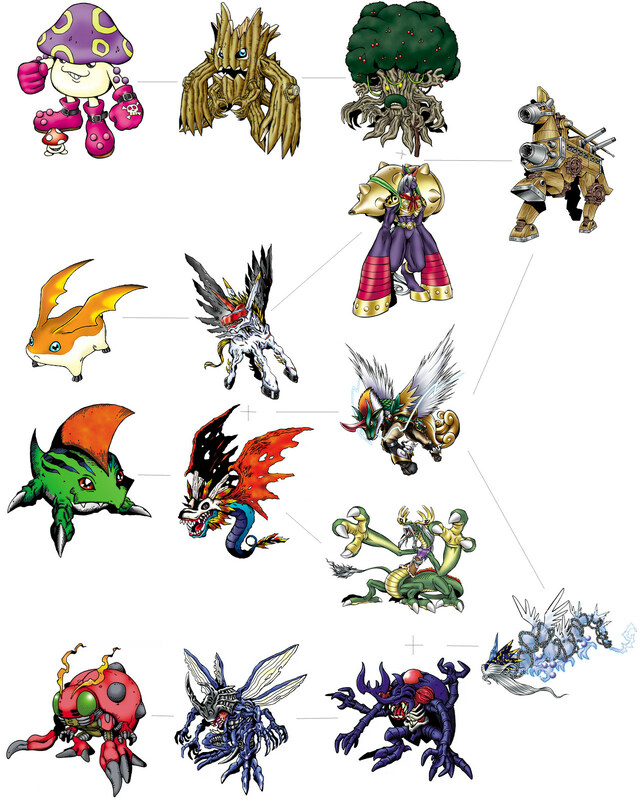 Well, out of that list, none of them are really intended/designed for each other, except for the Tyrannomon line (even then, MetalTyrannomon is the intended Ultimate, both profile-wise and in RustTyrannomon's game debut). I also favor Betamon > Airdramon > Megadramon, but instances of Betamon capable of evolving into Airdramon and Airdramon into Megadramon are so inconsistent. Callismon is a "canon" Mega to Grizzlymon. SnowGoblimon has Hyogamon, and Panjyamon is designed (obviously) for Leomon. Blastmon isn't even ice. Hyokomon has an entire "canon" line with Chronomon. Cockatrimon, profile-wise, evolves from Biyomon (as the inferior choice to Birdramon). Valdurmon is the intended Mega for the original Falcomon. If you weren't going for "canon" lines and just went for thematic lines that look like they fit together, then those are still solid lines. Last edited by YongYoKyo; 08-05-2018 at 08:52 PM. Last edited by Muur; 08-05-2018 at 08:59 PM. Patamon's kind of implied to evolve to Unimon. Air Shot becomes Holy Shot even. Dracomon is said to be the progenator of all dragon Digimon and looks like Airdramon, which is probably not a coincidence. There's probably more, like all 5 vpets cyborgs become Mugendramon so he could count as the end for 5 lines.I have no idea what anyone means by canon anymore though lol, because they canonically cross over all the time, like how Patamon has Angemon too and Tyranomon has Agumon. Last edited by flintlock; 08-05-2018 at 10:35 PM. Betamon's two Champions in the original V-Pet were Seadramon and Airdramon - they were his counterparts to Agumon's Greymon and Tyrannomon. In the same way that Greymon took precedence, but Agumon can still often become Tyrannomon, the same is true for Betamon with Seadramon and Airdramon - its just that they appear together far more rarely. This conversation reminded me that I love when a Digimon is clearly two things, like Kokuwamon is a machine/kuwagamon as a random example and Tylinmon here. Wasn't Biyomon like the only Digimon that could evolve into Airdramon by having perfect stats and no Care Mistakes in Digimon World? Airdramon would be seen as the equivalent of Greymon, Garurumon, Angemon, Seadramon, Kabuterimon, Leomon and Igamon in the game. Then again, before Togemon came around, was Igamon going to be Palmon's canon evolution, since he specifically made its appearance in a game where the anime was still in development? Two of the mons I always had trouble trying to fit in anywhere were Gorimon and Deltamon. At least with Gorimon, Deathmeramon makes a bit of sense, but Deltamon has Chimairamon then Milleniumon if it jogresses? It's messy. You could use Oruchimon to keep the multi head thing going.